Can eating a melon be a euphoric experience? Mike Hessel of Red Hat Melons thinks so. 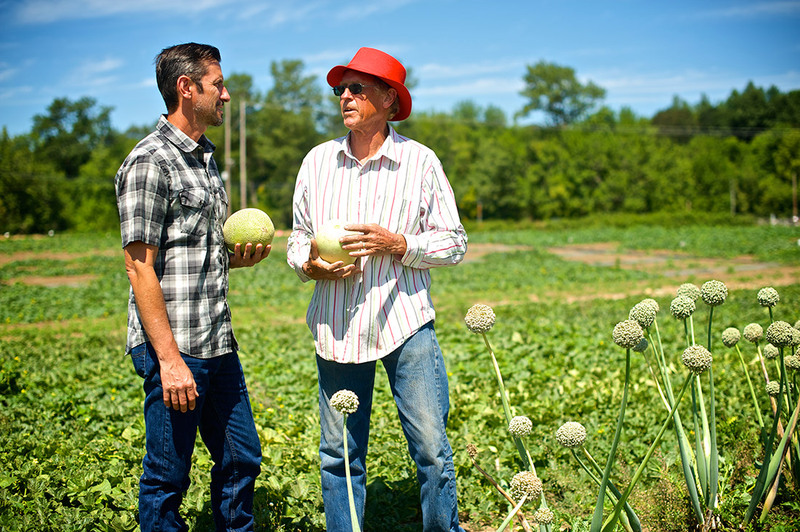 On 15 acres in Corvallis, Oregon, he grows what most consider the best melons they’ve ever tasted—sweet, juicy…perfect. That’s why his melons have reached cult-status in Oregon (no doubt in part to zealous sampling nearly everywhere he goes). Twenty-five years ago, Mike followed an unconventional path to farming: Before dedicating his life to nurturing fruit crops, he worked the back deck as a commercial fisherman in Winchester Bay, Newport and Alaska for nearly two decades. And before that, he was a two-time Olympian, competing on the US luge team in ’64 and ’68 (a fact that he only recently fessed up to publicly). It was at the intersection of his childhood home in Portland—SW Bancroft and SW Condor—that he’d brave the outdoors to rip down ice-covered stairs on his Flexible Flyer. “I had no fear,” he remembers. When Mike turned 40 he hung up fishing and searched for another career that would keep him outdoors. With a Master’s in plant breeding from Oregon State University under his belt, he took over a parcel of land as a sharecropper. And ever since, he’s been a beloved face at farmers’ markets and roadside stands in and around Corvallis. His favorite part of the gig? Watching eyes widen at the first taste of his melons. Easily confused for cantaloupes, Mike’s melons are technically muskmelons. Named for their fragrance (musk comes from a Persian word for perfume and melon is derived from a Latin word meaning apple-shaped), they’re either smooth or “netted” in appearance. But no matter the type, the age-old question remains: How do you pick a ripe melon? Surprise: squeezing isn’t your path to glory. It’s all about timing: “There are two types of ripe: ripe-to-pick in the fields and ripe to eat.” Mike prides himself on picking melons at the perfect moment, carefully slicing open test-crop specimens as his guide. To find a primo melon at the store, you have a few options. Gently press on the blossom end, checking for a slight give. But whatever you do, never ever touch the stem end (Mike must have reiterated this 10 times when we spoke). Why? “The stem end is too delicate and in most cases, you’ll put your thumb right through it. Almost everyone gets this wrong.” Or, follow your nose: if a sweet aroma is coming from a stand of melons, they’re likely ripe. If you don’t need instant gratification, Mike suggests buying a melon that hasn’t yet achieved ripe-to-eat status. Finding one that’s not quite there allows you to bring it to an even, edible ripeness at home, where it’s safe from impassioned squeezers. Simply place it on your counter and let time work its magic. As for refrigeration, don’t do it until your melon is ripe and cut; our too-cold home refrigerators abruptly halt the ripening process. But don’t overthink it too much. The flavor of a Red Hat melon—one that’s been precisely grown, harvested with gentle hands and delivered to market with care—will never fail to blow their mass-produced brethren out of the water. As for the future, slowing down isn’t in the cards. Mike still aims to improve his crops and hopes to increase acreage, allowing him to deliver down the coast of California on their off-season. Until then, you can still find him at local roadside stands, working his marketing magic with the simplest of tools: a knife and a perfectly ripe melon.